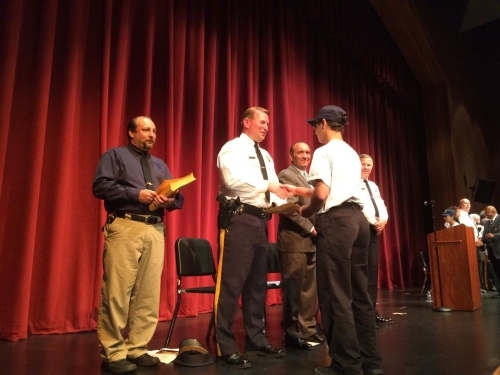 Neptune: Sheriff Shaun Golden proudly handed certificates to the 140 recruits who graduated from the 23rd annual Sheriff Youth Week. The program, which is no ordinary week of summer camp, began on July 13 and ended July 17, with a formal graduation held at the Neptune High School Performing Arts Center. 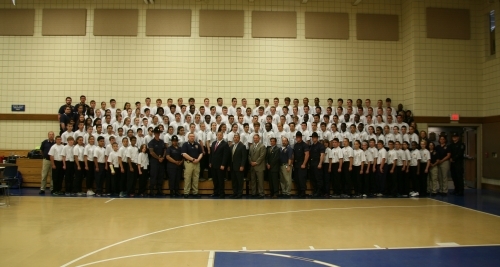 Sheriff Youth Week, based out of the Monmouth County Police Academy, provides high school aged students a unique opportunity to explore interests in law enforcement through police academy style training, exercise programs and instructional sessions. Each day began with drill and ended with exercise. During the week, the class learned about various law enforcement topics and agencies. An overview of the Monmouth County Sheriff’s Office Law Enforcement Division, the 9-1-1 Communications Division and the Monmouth County Correctional Division was provided. Presentations and interactive demonstrations included firearms safety and awareness, Certified Emergency Response Team (CERT) and Monmouth/Ocean Certified Emergency Response Team (MOCERT) mock drills, a bicycle safety obstacle, K-9 demonstrations from the Monmouth County Sheriff’s Office tracking, narcotics and explosive teams, a Project Lifesaver demo and a display of the sheriff’s special operations vehicles. Overviews of the media and law enforcement, distracted driving, gang awareness, the Drug Enforcement Agency and the Monmouth County Office of Emergency Management were also presented. “We learned a lot the past five days. It provided us with discipline and through hands on experience we were able to see the different parts of law enforcement,” said Grace Natsis, Aberdeen. There were also two major focal points of the week. On July 15, the recruits spent the day at Neptune High School. 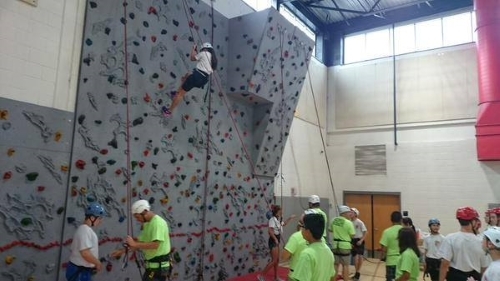 They learned about water safety and rescue at the Neptune Aquatic Center and participated in rock climbing and weights. On July 17, Jersey Shore University Medical Center provided them with a tour of the trauma unit and helipad and at Neptune High School’s SIM Lab they viewed a patient simulation with mannequins that simulate respiratory distress, coughing and other obvious signs and symptoms. Mr. and the late Mrs. William W. Wingard, of New Jersey Gravel & Sand in Wall Township have been the sponsors of Sheriff Youth Week since 1992 and were acknowledged at the graduation ceremony for their dedication and commitment throughout the years. A certificate of appreciation was presented to Principal Allen in memory of David Mooij, former Superintendent of the Neptune Township School District, for his unwavering dedication and support of Sheriff Youth Week, and his role in creating partnerships with the Monmouth County Sheriff’s Office including the establishment of Explorer Post #1 and the Law Enforcement Mini Academy.